Students have the opportunity to take RI tests a few times a year. The reality is that you can do it anytime you want..
Where it says "Reading Programs" chose Lexile. Hit Enter or Click on Title (at the top) and all our books in that range will appear. After you take your "Test" you get a list of suggestions based on your interests. Use that list! If you do not have that list go back to www.lexile.com and put in your Lexile Measure, chose some interests and hit Submit. ​Use that list and check our library for books. 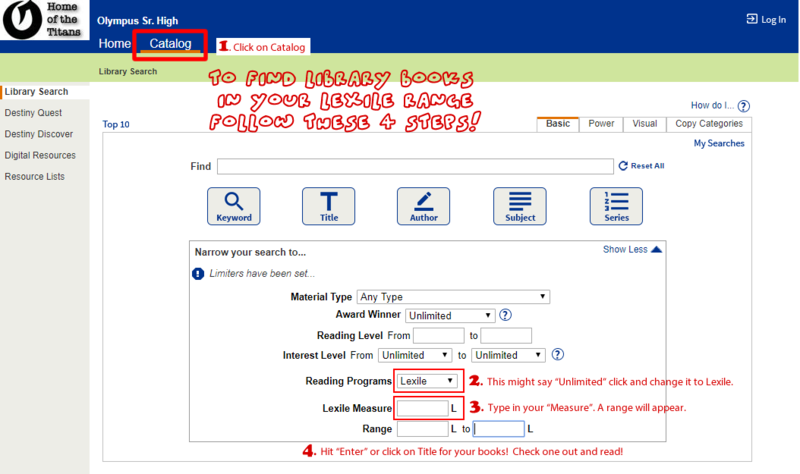 ​If you know what book you want... search for it and on the results page a Lexile Score is with the book!